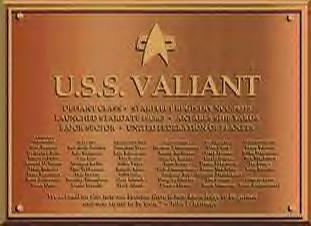 The Mission of the crew of the USS Valiant. Is to keep safe the the populace of the Federation, and be the keystone vessel of the fleet. It is currently docked in Space Dock around Earth, receiving preparations, and crewmembers before it embarks for Enark Zeta. A Trinary star system located in the Beta Quadrant, just outside the Federation - Romulan Neutral zone. Civilian trader ships from both sides have been strangely disappearing within the vicinity of that sector. Star Fleet Command has dispatched the USS Valiance to investigate the situation. The crew is to excercise caution and wariness in the events to come.